One thing I love about the whole Conan Universe is warrior women in reveling outfits. This Topic is about women wearing revealing warrior outfits in movies/tv and conventions etc. I will not be posting paintings/drawings or computer generated images of warrior women. Only photos and videos of warrior women over 18 etc. It is not about women in warrior outfits but women in REVEALING WARRIOR OUTFITS. 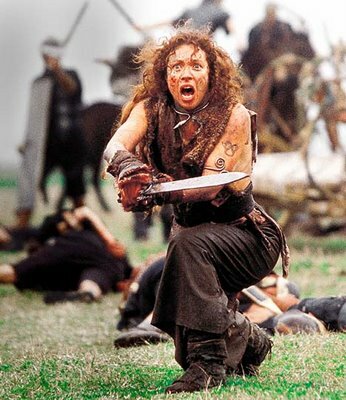 The first photo is of Alex Kingston in Boudicca (warrior Queen 2003). She was good in this movie and her outfit and look are great but it is not A revealing outfit. The next photo is of Adrienne Wilkinson in Xena and she is wearing A revealing outfit. This is an example of the stuff I will be trying to post etc. Here is Teagan Clive in Interzone she has a great physical shape. This clip is near the end of the movie so it might be a spoiler alert!!! 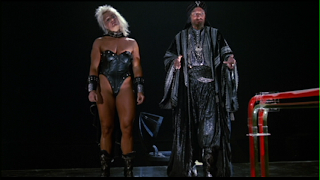 Teagan Clive in Alienator she would have been good in A Conan movie with that body. Neus Asensi in Heart of the warrior. One of the best sword and sorcery outfits I feel.